Download your copy of the 2018 Fall Wingbeats HERE! Download your copy of the 2018 Summer HackBack HERE! RAPTOR Inc. Celebrates 40th Anniversary! Planned Giving: A Win-Win for You and RAPTOR Inc.
Download your copy of the 2018 Spring Hackback HERE! Download your copy of the 2018 Winter Hackback HERE! Download your copy of the 2017 Fall HackBack HERE! Download your copy of the 2017 Winter HackBack HERE! Mystery of the Missing Peregines Solved? Download your copy of the 2016 Fall HackBack HERE! Download your copy of the 2016 Summer HackBack HERE! Eli the Bald Eagle is Accepting Visitors! Where Are the Cincinnati Peregrines? Red-shouldered Hawwk Spotted Alive and Well! Re-Enroll Your Kroger Plus Card! Download your copy of the 2016 Spring HackBack HERE! Thanks to caring Great Parks staff and RAPTOR Inc.
Winton’s ordeal began in early December, 2015. Visitors described seeing an injured hawk in the area for several days but no one could get close enough to contain it. Raptors are well adapted for survival and will use their last bit of strength to escape capture. On December 16th, the hawk was reported on the ground along the trail near the Winton Centre. The highly trained Great Parks team, which included Naturalist Susan Sumner, Natural Resource Manager Tom Borgman, Ranger Ricky Dove and Volunteer Cricket DeNamur, sprang into action and safely secured the bird until someone from RAPTOR Inc. could respond. RAPTOR Inc. is a non-profit organization with the proper state and federal permits, facilities, and staff required to rehabilitate injured birds of prey. Birds of prey include eagles, hawks, owls, falcons, osprey, and vultures. On admission, Winton was in extremely poor body condition. He was emaciated, dehydrated, infected with parasites, and had an obvious left wing fracture. The rehabilitators knew he was unlikely to survive, but aggressive treatment was initiated to give him his best chance. Once he was stabilized he was examined by veterinarian Dr. Joseph Grossi who confirmed 2 fractures in his left wing. Surgery was not indicated so the fractures were splinted and the bird was placed on cage rest. Only time would tell if the bird had the strength to survive and if the fractures would heal properly to allow for normal flight. After several weeks of intensive care, it became apparent that Winton would survive, but he still wasn’t flying. He was re-examined in February but no obvious reason could be found. The rehabilitators prepared for the possibility that Winton would never regain his flight ability and considered searching for a permit holder that could provide a permanent home for him. In the meantime, Winton continued to undergo physical therapy to build strength and conditioning. The additional time paid off and, amazingly, in mid-March Winton was ready to return to the wild. He was banded by a licensed bird bander and the finders were notified to participate in the release. To report an orphaned, ill or injured bird of prey in Southwestern Ohio or Northern Kentucky, contact RAPTOR Inc. at (513) 825-3325. To support raptor conservation or schedule an educational program, visit our website at http://raptorinc.org . Where are the Cincinnati Peregrine Falcons? Despite much anticipation of having a live web cam to peek into the world of a breeding pair of peregrines nesting on the 4th and Vine building of downtown Cincinnati, we have yet to see their arrival. In 2014 they began laying eggs early April; in 2015 it was the last week in March. As of April 5, we are beginning to think this may not be their chosen nest site in 2016. So where are the Cincinnati peregrines? Many questions come to mind. Are there still two peregrines downtown? Did something happen to one of them and a new mate is needed? Did the peregrines pull a switcheroo and find a nest site somewhere else? An expedition downtown was needed to help answer these questions since there are many sites there where the falcons were known to frequent. Downtown was originally chosen for the nest box site because peregrines nest on tall buildings as artificial nest sites and rivers provide good hunting opportunities since there are less opportunities for prey to escape. The Observation Deck of the Carew Tower is the best place to see the peregrines typically nesting in the 4th and Vine nestbox on the 27th floor. The nestbox faces the south side of the Carew Tower and with binoculars you can see inside the box as well as the other building sites where they perch. The falcons have also been known to perch on the letters of the US Bank building and the bank’s logo while they eat. Scanning other tall buildings for falcons sitting in nooks and ledges proved uneventful. The Daniel Carter Beard bridge is also a place to observe as they often sit on the very top. No falcons there either. Then out of the southeast flew a peregrine! Long angled wings, flying high, silhouetted against the sky! Flying toward the downtown area, this falcon could have been coming from northern Kentucky as well as Cincinnati. Trying to gauge the position, I lowered my binoculars in time to see a second falcon flying from the south. In a flash, they were gone; I was unable to see where they landed. Even though the siting was brief, I believe it was a peregrine pair and they are nesting somewhere in the area, maybe downtown Cincinnati, maybe in northern Kentucky. If they had a nest, it would make sense that they were seen for only briefly. If eggs were laid, they would not be away from them long. Perhaps food was being brought in or it was a change in incubating adult. Even though it is disappointing we are not able to peek into their lives for a short period of their lives via the live web cam, it was great to see that they are alive and well. Download your copy of the 2016 Winter HackBack HERE! On December 17, 2015, The Ohio Department of Agriculture officially rescinded the order prohibiting bird exhibition in Ohio. This order which was effective June, 2015 was originally intended to remain in place till April, 2016 due to the threat of the Highly Pathogenic Avian Influenza outbreak in Ohio. With no confirmed cases in Ohio and no immediate threat of the avian influenza, State Veterinarian Dr. Tony Forshey and Ohio Agriculture Director, David T. Daniels rescinded the ban which applied to country and independent fairs, the Ohio State Fair and all other gatherings of birds for show or for sale including sales, swap meets. RAPTOR Inc. was hit hard having to cancel 63 scheduled presentations accounting for the elimination of one of our main revenue streams. From the Pacific Coast to the Midwest, 16 states reported cases of the Highly Pathogenic Avian Influenza in late 2014 and continuing through the spring and summer of 2015, over 48 million birds were affected nationally. The avian flu is an extremely contagious virus that primarily affects domestic poultry and is likely spread by wild, migrating birds. With Ohio being the second largest egg producer in the country and home to 28 million laying chickens, 12 million broilers and 2 million turkeys, it was felt Ohio was particularly vulnerable to an outbreak of the disease. These chicken and turkey farms contribute to the health of the state’s economy and it was felt the 14,600 jobs created by these farms needed to be protected. 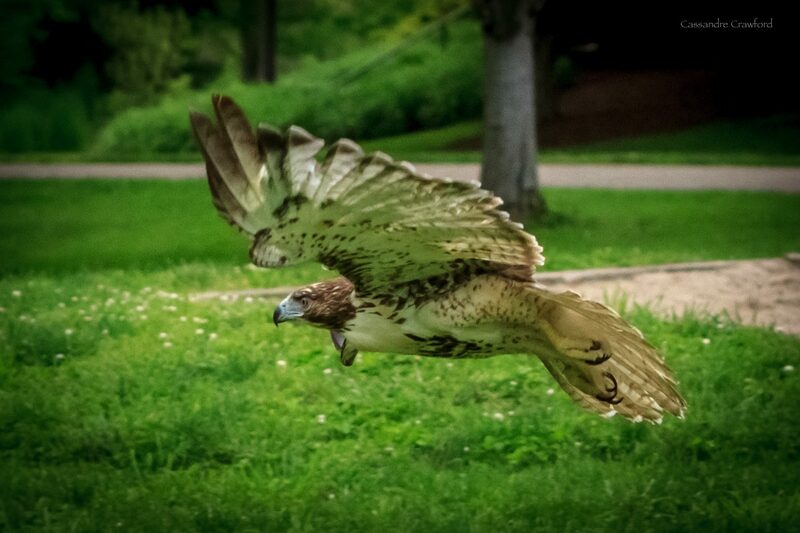 With the ban of taking our educational avian ambassadors off-site to educational presentations in effect from late June to late December, we focused on ways to bring guests on-site to learn about raptors. Dens of scouts visited our facility and learned about raptors as well as performed service projects. 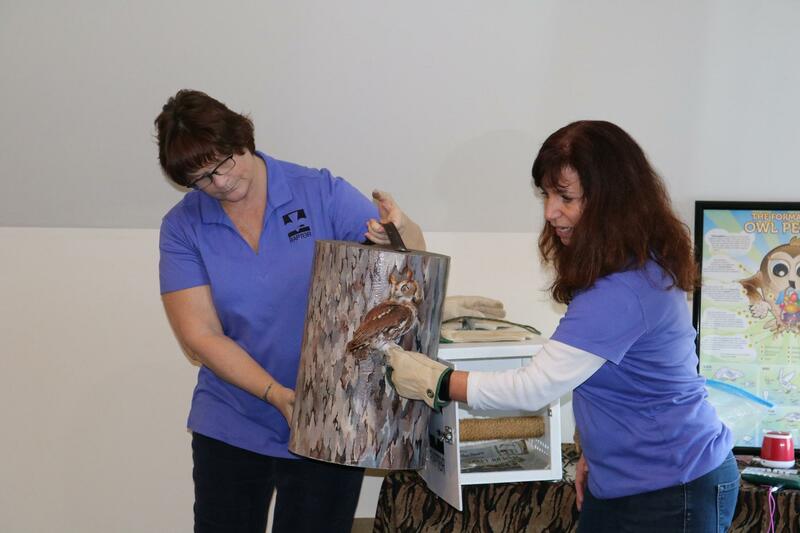 Families toured our avian ambassadors on “Soar-In Sundays”. 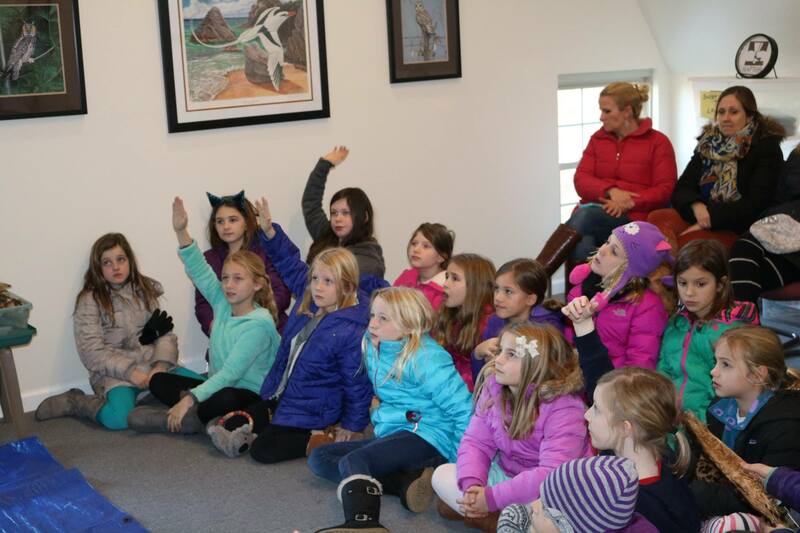 A Montessori school was able to tour our facility, as well as make owl masks and participate in a raptor identification game. As the saying goes, “When the going gets tough, the tough get going” and so it was with RAPTOR Inc.; we were able to refocus our energy and schedule 26 on-site presentations. Although the ban is now lifted and we will be traveling off-site for presentations, RAPTOR has taken steps to be open to the public at our Milford facility in 2016. Open Houses will be the last Sunday of the month, 1 – 4 PM, except in December when our open house will be December 18. We will continue being open to the public by appointment for private tours. Donations will be gladly accepted and appreciated. See our public appearance schedule at http://raptorinc.org/programs-open-to-the-public/. At the open houses, you will have the opportunity to view our educational ambassadors and learn more about raptors, speak with our trained educators, hear the vocalizations of native raptors and touch bio-facts. It will be fun for the whole family!